The 2014-2015 Academic Scholarships Distribution Ceremonies were held this past December throughout the five Zahal Disabled Veterans Organization Districts. 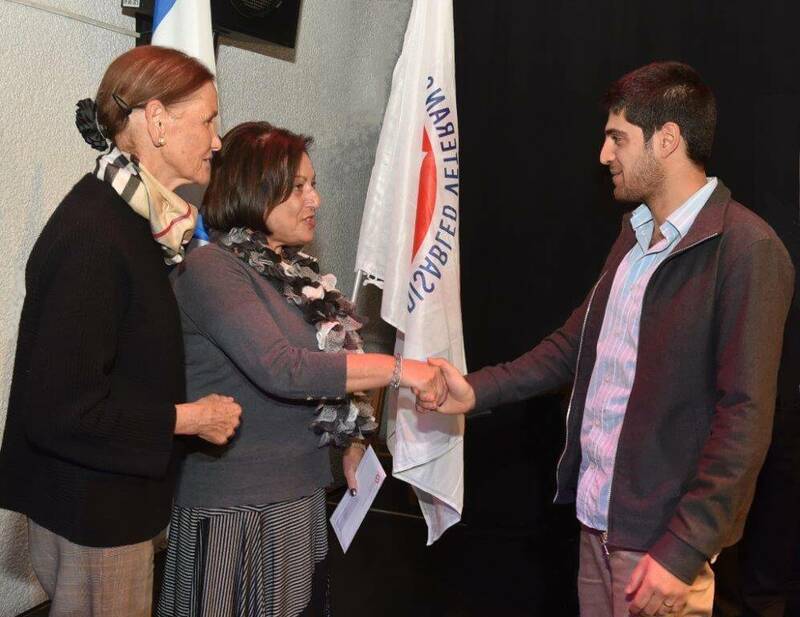 350 Academic Scholarship were handed out totaling some NIS 1,900,000 ($488,000 USD). Donors and representatives of contributing foundations took part in the ceremonies and personally presented the recipients with the scholarships. “A warm welcome to all. First, I would like to express my deepest gratitude to the ZDVO (Zahal Disabled Veterans Organization). You are the bridge between us, the disabled veterans and scholarship recipients, and the donors. Second, to you, the donors. Your generous support enables us to pursue academic and professional knowledge through higher education and inspires us to fulfill our calling, despite our physical or mental disabilities that were a result of our military service. Your donation is an opportunity; an opportunity that should be utilized to the fullest. Thanks to you, my opportunity brought me to Sheba Hospital, to the Neurological Rehabilitation Department. I would like to share my experience with you to tell you how I optimized your donation to fulfill my calling. My story begins in high school. I was in a high level computer programming track. After graduation, my plan was simple – to serve in the IDF as a combat soldier, study at university and then work in high-tech. My reality was different. I was critically injured when my tank rolled over during a combat Operational activity. I found myself in a hospital bed in the Neurological Rehabilitation Department at Sheba – Tel HaShomer Medical Center. The whole right side of my body was paralyzed, and the left side had no sensation of pain or temperature. During the course of my rehabilitation, I came to the realization that a computer was the last thing I wanted to interact with. I had an inner desire to express my difficult feelings and complex emotions. I discovered writing. Writing led me to theater and my bachelor’s degree in theater arts. Theater is a great medium to reach people and have an effect on them. But I wanted more. I wanted a more personal and direct interaction. I wanted something that will touch, help and influence people. I wanted to make a difference. I learned about an academic program that trains students to be drama therapists. It was clear that this program was for me. I enrolled and studied for three more years and completed my master’s degree in Expressive Arts Therapy. It was a bumpy ride; the course of these studies is challenging in many ways – academically, mentally, emotionally and physically. I was determined to carry on, and thanks to your support, was able to give back to Israeli society through the therapy skills that I learned and developed in my training. I worked hard and vigilantly to do my internship at the Out-Patient Rehabilitation Center at Sheba – the same department that I was hospitalized in. Finally, after a long, hard journey, I made it. For an entire year I worked one-on-one with patients and co-treated a few groups in the rehab center. I believe that this kind of closure proves that a person with a strong support system, including the personal interaction of the rehabilitation process, can achieve any goal that he or she wishes to pursue. I am positive that every scholarship recipient appreciates your contribution and your efforts, and on their behalf, I thank you. Because of your support, I was able to return to The Neurological Rehabilitation Department at Sheba Hospital – this time as a care giver, not as a care receiver (although, to be perfectly honest, I also received a lot in this process). The small scholarship seed that you planted manifested itself as an academic scholarship. It has grown, blossomed and become a tree. A tree made of leaves that touches and cares for people struggling with PTSD and anxiety disorders, as well as children in the Israeli educational system that need therapeutic attention. I hope that this tree will grow bigger and stronger and that I will be able to pay it forward. Disabled Veteran, Husband, Father, Therapist”.